It's hard to pick one when everyone is doing so well. In a year when the average silver stock gained 137%, and every single one of them handily beat the S&P 500, calling one the "worst" reveals the title to be subjective. Coeur Mining was far and away the best silver miner of 2016, rising 266%, substantially ahead of Hecla Mining, which is up "just" 186% year to date. 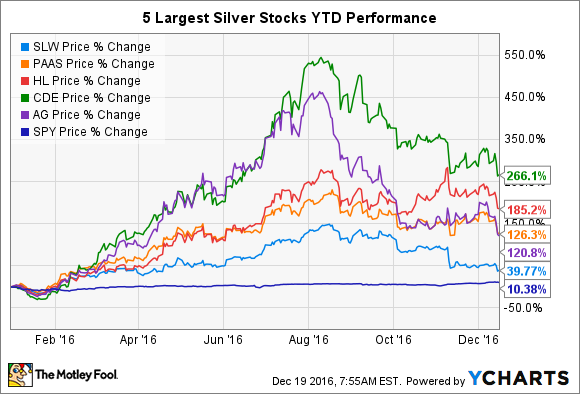 In fact, seven of the nine biggest silver stocks surged by triple-digit percentage rates, with even junior silver miner Great Panther Silver rising 179%. So, let's see why streaming giant Silver Wheaton (NYSE:SLW) is up only 41% in 2016, making it the worst silver stock of the year. Silver Wheaton is of course the largest streaming company, the unique business model that puts the risks (and costs) associated with mining the precious metal onto others while simply guaranteeing it will accept a portion of their production. In exchange for an upfront payment of money to finance its capital projects, Silver Wheaton buys silver -- and gold -- from miners at a fixed cost under streaming agreements. That may be the key difference as to why the actual miners did so well this year compared to the streamer's performance. Because the miners faced greater risks, the rewards that accrued over this volatile election year sent precious metals soaring. Silver prices started 2016 at $14 per ounce, and by late summer, they had soared 48% to almost $21 per ounce before easing back to the $17 or $18 per ounce range. Since the election, silver has slumped further and ended last week just over $16 per ounce, which explains why the miners have fallen since then, too. At one point, Coeur was up nearly 550%, while First Majestic Silver had been 450% higher. Moreover, the greater diversification Silver Wheaton seeks with gold streams will open it up to the fluctuations in gold markets, too. It's looking to increase gold streams until they account for as much as 45% of its revenue by 2020, up from 42% currently. It now has streaming agreements with mining giants like Barrick Gold (NYSE:GOLD), Glencore, and Goldcorp (NYSE:GG) that run upwards of $1 billion or more. While that diversity may create lower highs for Silver Wheaton compared to its rivals, it also should protect the downside and prevent lower lows, too. Further, miners also typically have a range of assets that vary in quality and production, which can raise costs while lowering production values. Silver Wheaton simply has a portfolio of high-quality assets covering 22 operating mines and eight projects under development, including Barrick's mines in Argentina and Peru and Goldcorp's Pensaquito, the largest gold mine in Mexico. Its biggest investments lately have been in gold. In August, Silver Wheaton and mining giant Vale (NYSE:VALE) entered into their third agreement over the Salobo copper project in Brazil. The original agreement in 2013 saw the streamer buy 25% of the gold from the mine, which was then extended in March 2015 to purchase an additional 25% of the output. This summer, its ownership increased to 75% of the gold stream in copper concentrate in exchange for an $800 million cash payment with future streams possible as Salobo expands. It was gold sales from Salobo, as a matter of fact, that led Silver Wheaton to report record quarterly gold production last month and a 20% increase in its dividend. It's easy to expect Silver Wheaton will be diversifying its streams even more across metals, miners, and geographies in 2017 and beyond. That may help it lower its cash costs in both silver and gold, which, in the third quarter, amounted to $4.51 and $390 per ounce, respectively. Even if the prices of silver and gold fall further, the streamer is in no danger of not being profitable, and it would require a substantial collapse in value for that to happen. With a dividend that's linked to its operating cash flows over the past 12 months, Silver Wheaton's payout looks secure and stable, even if it does fluctuate somewhat over time. A best-in-class business model also separates it from other streamers in the market as well as the miners with which it contracts. All of this means investors could stand to have more "losers" like this in their portfolios.